More women are struggling to afford contraception and that, in some cases, they are risking their physical and emotional health by delaying abortion procedures for weeks as they seek a way to pay the cost. One married woman told the Tribune she and her husband made the painful choice to end her pregnancy because they could not afford a third child. But the family’s insurance doesn’t cover abortions, and not until her 14th week could they pull together enough money to pay. Abortion rates have been declining for years, and experts said it is too early to know if the nation’s financial woes will change that trend. Other articles are reporting similar findings. As the economy worsens abortions are on the increase. I think the implications for the church are massive. We have an opportunity to stand up and save lives or swim with the current of our culture of self-preservation. There is no difference here between the women who are killing their babies because they don’t believe that they can afford to raise them and Christians who think they have no responsibility in caring for these babies. The root of both is selfishness. That said, the article does share some good news. Calls to adoption agencies and pregnancy resource centers have increased as well. Just this week I received two emails about the need at adoption agencies for adoptive couples because of this increase. Will God’s people stand up and volunteer to meet this increased need at their local pregnancy care centers? Will Christians refuse to allow finances to hinder them from stepping out and adopting these children whose mothers are placing for adoption? Will the church open its doors to the children in foster care? I love to dream of the day when we could fill the Washington Mall with a million Christian families who are willing to adopt every baby being considered for abortion and every child waiting in the State foster care system. I can’t help but think we need to get started on this. All it will take is one couple at a time. One by one. One church by one church getting a vision. The Tribune goes on to mention the National Network of Abortion Funds, whose members raise money to help women pay for abortions. They say calls to state and local affiliates from women seeking financial assistance have increased from 50 percent to more than 100 percent in recent months. Calls to the national office, which provides referrals, have almost tripled from a year ago, said network Board President Toni Bond Leonard. Until reading this I did not know these organizations existed. I am not surprised but freshly reminded that the need for ministries like ABBA Fund, Caroline’s Promise, Shaohannah’s Hope and the many other organizations that raise money to help families adopt is greater now than ever! Those questions should never have to lead to abortion! We should have enough money, support, help to provide an alternative, no questions asked! O Lord, have mercy on the women in these situations, the babies in their womb; and move your church with mercy like never before to provide the alternative and help they need. May it not be said that the church was simply wise during this recession with how it spent its money and did ministry. May it be said that the church spent more and gave more and did more than ever before because they knew the value of life and the reality of eternal life! 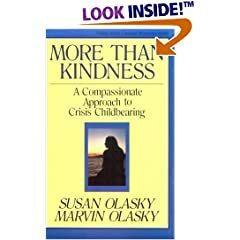 Olasky offer a biblical response in More Than Kindness, the tenth book in the Turning Point Christian Worldview Series.